Oh, the dreaded burpee. We love to complain about this uniquely punishing movement, and try to avoid doing them as much as possible. 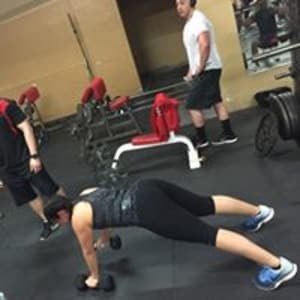 But have you ever stopped to wonder where the burpee came from and why this torturous exercise is a favorite of fitness professionals across the globe? Royal H. Burpee was a physiologist in New York City in 1939. 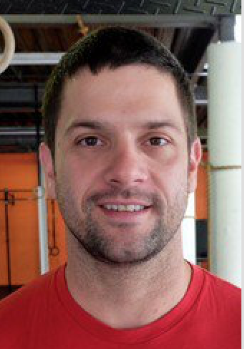 He invented the first version of the burpee as a part of a fitness test. The original movement was milder than the burpee we know and love hate today. Mr. Burpee never intended for his fitness evaluation tool to become the form of exercise that it has become today. The burpee was intended to be performed 4 times in a row, and he would measure the participant’s heart rate before and after in order to assess their heart’s efficiency at pumping blood, thus determining their overall fitness rate. Original Burpee: Squat down and place both hands on the floor in front of you. Jump feet back into plank position. Jump feet forward. Return to standing. Perform only 4 times in a row, measuring heart rate before and after. Modern Burpee: Bend over or squat down and place both hands on the floor in front of you, just outside of your feet. Jump both feet back into plank position. Drop to a pushup — your chest should touch the floor. Push or snake up to return to plank position. Jump feet back in toward hands. Explosively jump up into the air, reaching arms straight overhead. Perform as many times in a row as instructed by your trainer! Burpees: The Most Effective Exercise Ever?!? When you perform a modern burpee you are essentially doing a vigorous six-count bodyweight movement that requires you to move between six unique positions as quickly as possible. Everything burns as you go through a series of burpees: your lungs, your legs, your arms, and most of all…calories. Burpees cultivate agility, strength, coordination and stamina while burning fat. So the next time that you are told to do 20, 30, or 100 burpees: smile to yourself, think of Royal H. Burpee and be happy that you are doing an exercise that gets you enviable results in the shortest possible time. Having trouble motivating yourself to get off the couch and into a burpee workout? That’s where I come in. It’s my passion and my calling to help get you into the best shape possible. I am one simple phone call or email away, so act now and get started on your best beach body ever. Let’s do this together! Looking for a crispy, crunchy snack that won’t derail your fitness results? 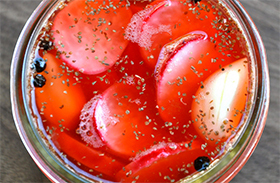 Look no further than this simple recipe for Easy Pickled Radish. Enjoy these sliced over your next salad, sprinkled over braised meat, or enjoyed straight out of the jar! Slice the tops off of the radishes and thinly slice into rounds. Place the radish rounds in a pint-sized canning jar. Slice into the garlic cloves in multiple places, then put on top of the sliced radishes. Top with the peppercorns and celery seeds. In a small saucepan, combine the vinegar, water, honey and sea salt. Place over medium heat and stir constantly until it comes to a boil. Pour the mixture over the radish rounds. Allow the mixture to come to room temperature. Serve immediately or keep in the fridge for up to 2 weeks. Enjoy! Nutritional Analysis: One serving equals: 17 calories, 0g fat, 3g carbohydrate, 194mg sodium, 2g sugar, 0g fiber, and 1g protein.